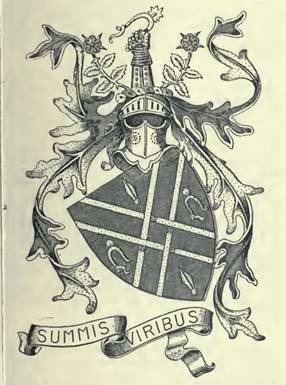 Arms were granted to Henry Harben of Seaford Lodge, Hampstead, London in 1877 – Vol. LIX fol. 317. Arms: Azure a saltire parted and fretty between two spear heads in pale and as many spurs with leathers in fess Or. Crest: A cubit arm in armour the hand in a gauntlet proper holding a spur leathered Or between two roses Gules leaved and slipped also proper. Henry Harben was the driving force behind the Prudential Insurance Company and was knighted in 1897.